Anyone with a remote interest in gardening will have heard about James May’s plasticine garden at Chelsea Flower Show last week. An insider at the show said “it was touch and go. Some thought it would damage the RHS and what it stands for.” Love it or hate it, it has certainly provoked a reaction in people. Thousands of people crowded round May’s child like garden complete with apple tree, stream, rockery, veg patch and grapevines. 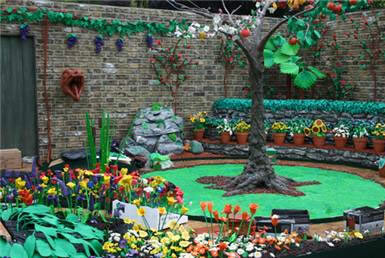 The garden was made entirely out of plasticine models of fruit, flowers and plants. 2.5 tonnes of plasticine in 24 colours was used to make it. The team behind the garden labelled it “a sculpted art installation, not constrained by the rigours of season, climate or geography”. 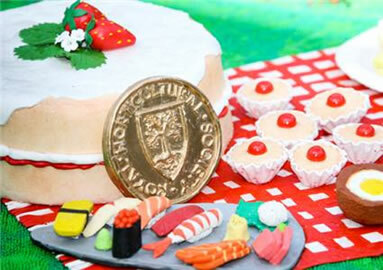 The models were made by hundreds of volunteers including school children, war veterans and professional model makers. I can’t decide whether I think it’s a very clever piece of art designed to highlight gardening for all age groups or a stunt to gain publicity for May’s new television show about children’s favourite toys. The question that sticks in my mind, is how it could it be judged as a garden if it contained no real plants? The Chelsea judges obviously knew they couldn’t judge it as a normal garden and therefore it was awarded a plasticine medal instead. While I’m sure there are many true gardeners whose distaste for the garden will linger long after the plasticine has melted. The people have spoken and voted for it in their thousands. It has gained the much coveted Peoples Choice Award for small gardens. These little pretty little flowers appear quintessentially British. Although most species are endemic to New Zealand. Only a couple of the 50 or so varieties have been introduced to Europe, Asia and America. They are part of the Boraginaceae family and many share the characteristic of hairy leaves. 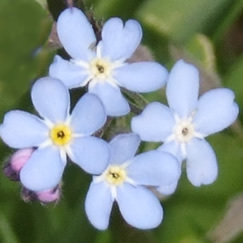 The wood forget-me-not is commonly seen in the UK. It prefers rich moist soil and shady conditions. Many of the varieties feature five petalled flowers. In the UK they are most commonly seen in blue, but are also available in pink and white. 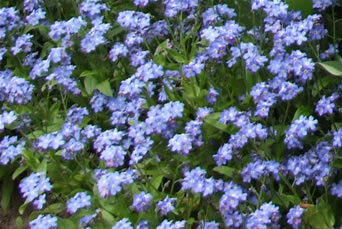 They are available in spring and flower in gardens during May and June. They have a vase life similar to other spring flowers of about 5 days. They are used in weddings for their beautiful soft blue colour and the connections to love and romance they have. There are several legends relating to the plants name. One German legend says that a medieval knight and his love were walking beside a river when the knight picked a posy of flowers. The weight of his amour caused to him fall into the river and as he was drowning he threw the posy to her shouting “forget-me-not”. Forget-me-nots are easy to grow in your garden once sown they will pop up for years to come often in different places to the previous year. All they require is a little shake of the seed heads to broadcast them ready for next year. May is the perfect time for soft blues. Which make for a very elegant spring wedding theme. 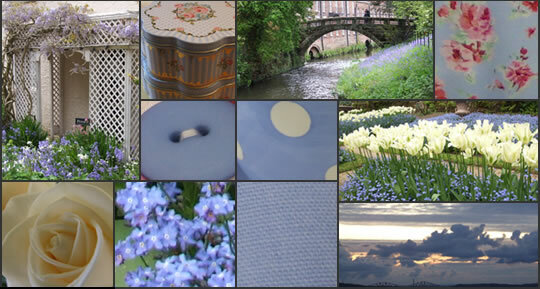 Gardens are filled with powder blue forget-me nots, delicate bluebells and dreamy wisteria blooms. Don’t be afraid to mix silver and greys into this kind of colour scheme. Shades of muted greys and cool blue will compliment one another. The grey painted trellis looks beautiful next to the wisteria. These kind of colours really suit a vintage theme as well. There are no end of vintage style bits and bobs in shades of blues and greys. From ribbons to cake tins, chintzy fabrics and vintage crockery, you’ll have no problem finding the perfect accessories to go with this colour scheme. If you decided on blue for bridesmaid’s dresses and other outfits I would suggest staying with ivory flowers and just a touch of blue, such as forget-me-nots dotted throughout or soft bluey grey eucalyptus. Or if you want the flowers to be the main focus of colour go all out with the blue and have a hand tied bouquet of English grown bluebells with a simple foliage collar. Young flower girls in ivory dresses with a blue sash would be picture perfect carrying a small basket of rose petals. I recently came across this amazing tree at Quarry Bank Mill in Styal. In spring it is transformed by the pure white bracts that appear on it. 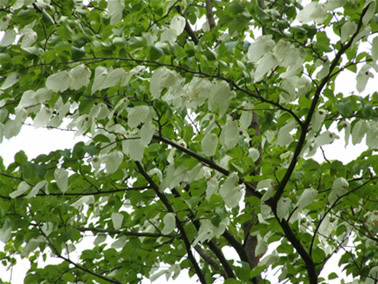 It is called the handkerchief tree because of the unusual flower like bracts that resemble handkerchiefs. The white bracts are truly beautiful fluttering in the breeze. They grow up to 15cm in length and hold a small round flower in the centre. 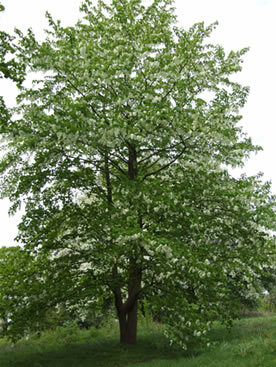 The tree was discovered in China by the French explorer Pere Armand David in 1869 and introduced to Europe in 1904 by young botanist Ernest Wilson. Wilson was commissioned by nurserymen to bring seeds back to England. He had quite an adventure before he managed to send any seeds to England. He was attacked by local bandits, caught a life threatening illness and nearly drowned when his boat capsized on a river. The seeds of this rare tree are very slow to germinate. It can take up to two years for any sign of life to appear and a further eight years before the plant might begin to flower. Due to the population growth in China the tree’s natural habitat has gradually decreased and it is now an endangered species. The Chinese government has made it a protected plant. Colours: shades of white and creams through to blush pink, deep pinks and dark crimsons, pale yellow is a rare colour. Peonies have been prized throughout history for their beauty and healing properties. The name Paeonia is said to come from Paeon the God of healing in Greek Mythology. The Greeks believed the peony could cure many ailments and every monastery would have a plant. The Chinese have cultivated peonies for over 2000 years, where they were highly prized for exquisite blooms and the medicinal properties. Many parts of the plant were thought to be of medicinal use. Today medical researchers are isolating compounds that research has shown may be useful to help create new drugs to treat diseases in the future. The peony has inspired artists for centuries all over the world. 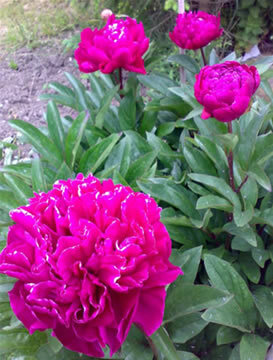 Peonies are featured in many Chinese motifs on items such as clothing, porcelain and tapestries. Peonies became popular in European art much later towards the end of the 18th century. Renoir and Fantin-Latour both painted peonies. The peony season is very short from May to early July which seems to make them even more desirable. 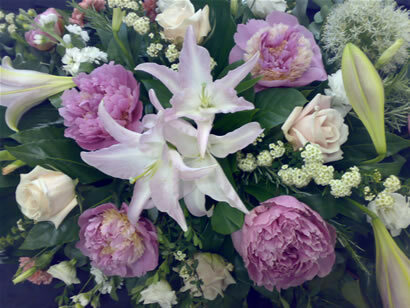 Peonies are always popular wedding flowers. There are hundreds of varieties and colours to choose from and many have a beautiful fragrance. A popular cut variety is Sarah Bernhardt, a large double flower with ruffley, rose pink petals. Peonies have enjoyed a renaissance in recent years after going out for a favour for a period of time. They are gorgeous in country garden bouquets and make the prettiest wedding bouquets with their luxurious blousy petals in romantic colours. English peonies are also available from growers across the country (weather permitting) what could be more summery than a jug brimming with scented English peonies.